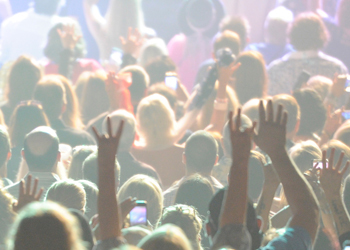 Ruth Eckerd Hall puts on over 250 shows a year – from here at the Hall, to the more intimate settings of the Capitol Theatre and the Murray Theatre, the beautiful waterfront stage at Coachman Park, and anywhere On the Road. These shows would not be possible without the help of our amazing volunteer ushers. It takes a village to put on a performance - and our village is large. 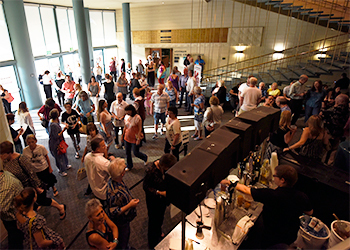 There are over 300 active volunteer ushers who help put on our shows through assisting patrons with seating, answering general questions and much more! There are also community relation volunteers who represent Ruth Eckerd Hall at events and festivals such as Blast Friday in Downtown Clearwater and Clearwater Jazz Holiday in Coachman Park and administrative volunteers who provide support to our administrative office in the Development, Education, Marketing and Ticketing Departments. 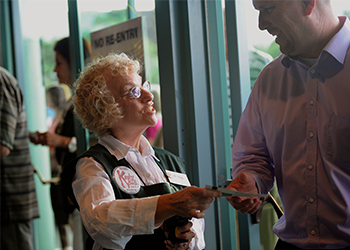 “Volunteering is unbelievable, especially if it’s doing something you love” – Sabrina, former volunteer usher and current Ruth Eckerd Hall employee. That seems to be the general consensus of our volunteers when asked why do they do what they do, at the core of it is a love of the arts and the excitement, the magic, the unexplainable joy only a live performance can give you. At each performance you can count on seeing our ushers ready to assist patrons. On occasion, you’ll see them dancing in the aisle or even catch a smile from them as they see their favorite performer. One of the best reasons to volunteer is to experience the shows! Ushers work at least 4 shows a month, the process is as easy as signing up online which shows you would like to work. You have to be 18 or older though, sorry kids. We had a chance to speak with a couple of our long-time volunteers. Arlene, who began volunteering at Ruth Eckerd Hall in 1983, briefly told us about her experience. After moving to Dunedin from Manhattan, NY, Arlene longed for the theatre. It wasn’t until Ruth Eckerd Hall opened its doors that Arlene felt at home again. 30+ years later – Arlene’s passion for theatre and Ruth Eckerd Hall exudes through her volunteer work. Helen is another one of our amazing volunteers – she began volunteering in 1986 and continues to this day! When choosing where to retire, Helen said that being in a city with a performing arts center was a must for her. When she found out about Ruth Eckerd Hall being built, Helen was set on Clearwater. When asked what she loves most about volunteering at Ruth Eckerd Hall, Helen said that the friendships she’s made and how she’s able to help keep performing arts in the community were at the top of her list. If giving back to the community and experiencing how the performing arts can change lives interests you then fill out an application and become a part of the REH family today!